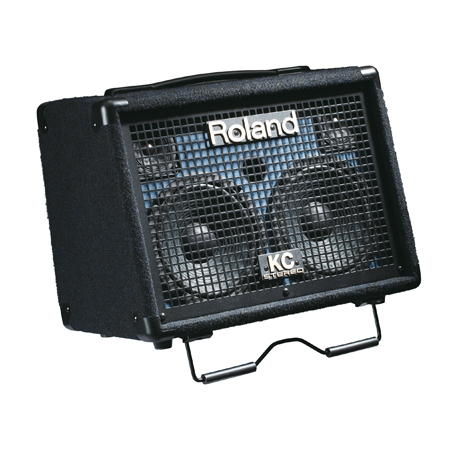 KC-110, Keyboard Amplifier from Roland in the KC series. Michlef's review"A true Swiss-army knife...It's awesome!" Very light amp but beefy in terms of performance. STEREO! ! It must be noted because it's indispensable for the Leslie effect. and thanks to the effects, the harmonica is great. 2X stereo Line inputs (Jack), so 4 inputs. 1X iPod, CD input (Mini-Jack stereo, RCA). I tried it out with a drum machine and it's good! 1x stereo output (Jack) allows you to link two (which is what I do)... a true "Swiss army knife." Effects: very nice Reverb, and a Chorus that is OK, Headphone out. 30W output power on mains, 20W on batteries (8x1.5V). Have a try, you won't believe it. First of all is the sound! It's really worth it to dive into the (comprehensive) manual, you'll discover its infinite possibilities. It can be tilted, like the big ones. I have two behind me and people are always looking for the speakers everywhere. Roland is truly pro. It's a pity that, between 30w and 350 w (just as good), they haven't come up with something... lighter! I use two with a Hammond SK1 (killer Leslie!) + wireless acoustic Gibson in the line input + wireless mic in the other input + Harmonica mic on the XLR input + a Roland drum machine in the AUX. Both are connected in stereo. More than enough for a club. Onstage, I use them as monitors (they can be tilted) and the console amplifies everything coming out of the output of the second amp. Its great, I can control my levels personally and don't depend on anyone else. I bought one in 2012 and immediately realized the pros of using it in stereo, so I bought another one secondhand. When I switched to the Hammond 2 keyboards pedalboard, I added a subwoofer. Would I buy it again? Without hesitation, because I've had some very bad experiences before. Roland is Roland. Charlico's review"Very good (mobile) keyboard amp"
No need for a user's manual. I've been using it for a month and I'm quite satisfied with it. What I like best is that it works on mains or batteries. It might be a bit expensive for a 2x15W amp. 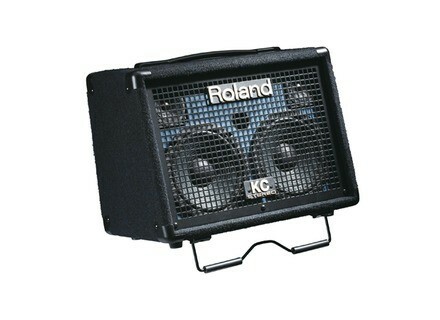 But it's a Roland and it sounds great! ! ! yoTrakkz's review"great amp for live use"
The whole amp is only around 10lbs and has a solid feel (wooden cabinet) to it to with a metal grille in front. Tough stuff. As opposed to the BA330 which is 20lbs heavier and looks more fragile and is $200 more - for what, exactly? With the AA batteries, the KC110 will output at 20 watts max. And so I keep the channel gain and master volume at 100% and control my volume from the Fishman preamp. With the unit up on a speaker stand, it is clearly audible above civilized chit-chat at well dressed affairs. It couldn't compete with a rowdy bar crowd, however. Use it accordingly. I use reverb sparingly. At about 25% applied, I find it to be pleasant sounding. Bear in mind that you'll need a speaker stand with a 1 1/2" inch diameter. If you have a speaker stand with a 1 3/8" diameter you'll need an adapter. Another nice feature of this unit is the mic input on Channel 1. It's not phantom powered and so you'll need to use a dynamic mic. I highly recommend the Shure PG48. It has an on/off switch and comes with an XLR-XLR cable. Useful for those situations when I need to make an announcement while playing. The unit also has auxiliary inputs (RCA and mini) so that I can plug in my iPod to keep music going during breaks. Previously I had the street cube which I thought was a little 'nasally' in sound, but this one is much better. I think the street cube is probably more orientated to guitars but this little chap sounds good with every input thrown at it so far! Believe me, for the money I don't think it cant be beaten, It's one of those pieces of gear that you'll have for years as opposed to other stuff that gets swapped and changed.